Green Bulrush is also known as Scirpus Americanus. Hardy planting zones are 3-9. The growth rate is 4-foot per year. It can reach 6-8 feet in height and 4-5 feet in width. The soft-stemmed sedge is native to North America. The leaves are brownish-green and slender. 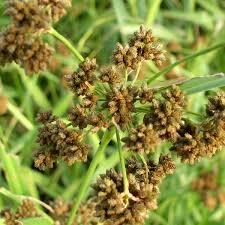 This sedge tends to grow better in salty water but can be planted in fresh water gardens as well. 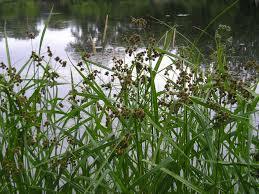 It grows in marshes and along lakes or streams. This sedge needs moderate to saturated soil. It also requires partial to full sun. The bloom time ranges from late spring to early fall. The grass is commonly planted in shallow water gardens. These grasses proliferate and can grow to maturity the first year they are planted. These are also great to work and help with soil erosion problems around a lake, pond, river, and creek. They provide a very natural look as they grow and can multiply while they are growing to create a beautiful look. They look great when added to water gardens that are located on a lawn. These plants are very easy to grow and do not take any particular care as they grow. They can also be cut down but come right back. This plant can also be seen growing wild along the edge of woods where the soils remain moist and right for their growing. These also provide an excellent place for small wildlife to seek protection as they can grow to become very thick and dense. The Green Bulrush is also called the Dark-Green Bulrush or the Scirpus Atrovirens. It grows to be quite tall which makes it an excellent contrast to neighboring plants and grasses. It grows quite well on its own and will blossom in May through June. Its sprouts can get up to 25 spikelets. It will develop blossoms that are yellowish green. It adds a vibrant hue to any garden setting and works well around water gardens. The Green Bulrush is an excellent choice if you want to add some nice contrast to any garden setting or landscape project.